Hi readers, I haven’t done reviews for a long time now and hence when Couponia.in approached me I decided to take it forward and explore what was so unique about this website. I have a passion for hunting down deals and buying the best brands at the best possible price. While going through Couponia.in I was convinced that the website indeed reflected my passion! Couponia.in offers a huge range of discount coupons and vouchers for purchases at your favorite online shopping stores. There is an interesting story behind this collaboration too! Recently my parents and sister visited us from Mumbai and brought along wonderful goodies that the whole family loved. I can easily say that online shopping portals such as Jabong.com were responsible for this success! It couldn’t have been simpler than creating a wishlist from scores of items available at the click of a button. I just sent this wishlist over and all they had to do was purchase online and bring it here to Sydney (since there was no shipping outside India). Now if my desired goodies could be shopped at great discounts wouldn’t that be like icing on cake! Well, Couponia.in offers exactly that. Interestingly, Couponia.in has strategic tie-ups with a number of fashion portals and offers exclusive coupons that you can use while shopping at these websites. To use the coupons from such portals is a fairly simple process. 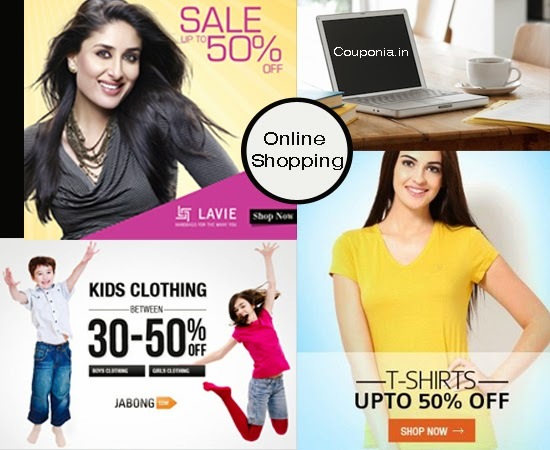 Just visit Couponia.in and look for your favorite stores and products, for example Jabong is one of my favorite ones. Once done, simply note down the coupon code of the product you are interested in and return to the shopping portal. You can then enter the code at the appropriate stage of the buying process, as required. The best part of Couponia.in is that you don’t even have to register for the coupons. If you wish to remain updated on the latest offers, all you need is to subscribe to the newsletters and end up saving a lot of money on your favorite products! So go ahead and indulge..you’re sure to make the perfect choice with Couponia.in!! This post has been written in collaboration with Couponia.in. Compensation will be provided by the way of mutual promotion via social media. Nice review. Will definitely try this. Myntra is my fav!